University Communications Network > Ask Dr. Universe > Food and Health > DNA: Extract it! Not too long ago, some of my friends at Washington State University showed me how to extract DNA—from a strawberry. You can try it at home, too. You’ll need simple ingredients, including dish soap, meat tenderizer, rubbing alcohol, and strawberries. Just like humans, strawberries and other plant life are made up of cells. Inside cells, you’ll find their DNA. Your DNA contains the instructions for your eye color, hair color, and if that hair is straight or curly. These traits can be passed down through generations. A strawberry’s DNA also holds information about the fruit’s color, size, and shape, and that it has seeds growing on the outside. When we extract DNA from a strawberry, we have to bust through a few parts of the cell to get to the DNA. We start out mashing up the strawberries with a little water and pouring the smoothie-like liquid into a test tube. Then we add a little dish soap to help dissolve a layer around the DNA called a membrane. Next, we add a bit of meat tenderizer to break up proteins that help hold different parts of the DNA together. But the DNA can’t separate from the rest of the ingredients without one final step. Add some cold rubbing alcohol to the mix and it will pull DNA up to the top of your test tube. When you try this out, ask yourself—does it look a bit like a booger floating in your tube? If so, you’ll know you’ve got the strands of DNA. While living things carry around DNA in their cells all the time, it’s not every day people actually get to see it up close. That’s what my friends and I like most about showing people how to extract it. If you want to turn this project into an actual experiment, you’ll need to test an idea or question about the extraction, too. What happens when you add more or less of an ingredient? Can you extract DNA from all vegetables and fruits? I’m sure you can think up even more questions to test out. Give it a try one day and let me know how it goes. In the meantime, tell me about the latest science project you tried at home or school. Email Dr.Universe@wsu.edu or write to Dr. Universe, PO Box 641227, Pullman, Washington, 99164-1227. Got a science question? Email Dr. Wendy Sue Universe at Dr.Universe@wsu.edu. Ask Dr. Universe is a science-education project from Washington State University. 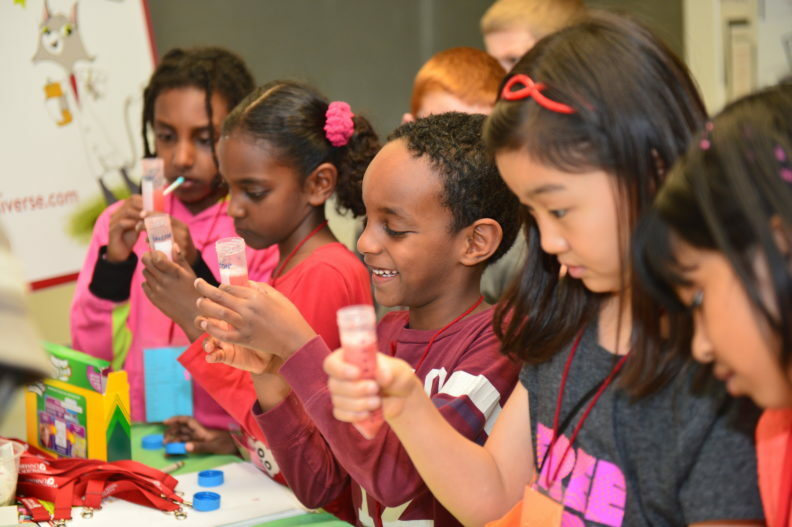 Dr. Universe teaches children how to extract DNA from strawberries during Kids Science and Engineering Day sponsored by the Society of Women Engineers. Strawberries work great for this do-it-at-home experiment, but so do bananas and other fruit. Drop a strawberry into a clear glass or plastic cup or jar. Use a blender or spoon to smash up the fruit. If you put the fruit in a baggie, smash it up inside the baggie. This breaks up the plant cells. In a separate cup, mix together about 1/2 cup of water, a teaspoon of dish soap, a dash of meat tenderizer and a teaspoon of salt. Add the liquid mixture to the smashed fruit. Smash them together to further break up the plant cells. Try to avoid making a lot of soap bubbles. Place a coffee filter inside a clear cup or jar. Pour the fruit mixture into a coffee filter. Twist the coffee filter to force the liquid into the cup. Take ice-cold rubbing alcohol and carefully pour it down the side of the cup or jar. Do not stir or mix! You should use about as much alcohol as you have fruit liquid. You’ve just extracted DNA from the fruit. Within a few seconds, you should see a white, cloudy substance floating to the top of the liquid in your cup or jar. That’s the DNA! Use a cotton swab or wooden stick to pick up strands of DNA. « Brain Freezes: Why do we get them?